One of the best palm trees for foliage is the little known Johannesteijsmannia altifrons or ‘Diamond Joey Palm’. 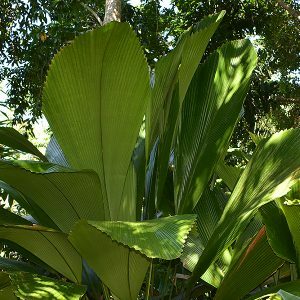 This is an understory plant from the rainforest of Malaysia and although it will reach around 3 – 5m in height it has no real trunk, this palm tree is all about foliage. The leaves are diamond shaped as the name suggests, they are not divided at all, but are heavily pleated. Although this is palm tree that tolerates colder climates than in its natural habitat it grow best in warm humid climates. One of the major problems is root disturbance, Johannesteijsmannia altifrons does not like to be moved and even seems to resent any rough handling when being repotted. A sub tropical climate is best however a warm position in temperate areas is worth a try, cold and dry conditions are definatly not suitable and cold drying winds ar e a bit of a disaster. These palm trees are also grown indoors in shopping centres and commercial buildings. Botanical name – Johannesteijsmannia altifrons. Common Name – Diamond Joey Palm. Position – Shade to dappled shade. Best climate – Tropical to sub tropical. Height – To 5 metres in ideal conditions, usually lower in cultivation. Spread – These are a solitary palm, the foliage will spread to 5 metres. Foliage – Mid to deep green, diamond shaped and deeply pleated with serrated edges. leaves appear on tall stalks. The stems are armed with spikes. Flowers -White to cream in clusters followed by small fruit. Container growing – Yes they will grow in containers however they are a large plant. Indoor growing – Yes, however away from air conditioning and they will require misting to increase humidity. Diamond Joey Palms are available for sale from the following Nurseries.